This is my third and last post about Warwick Castle in Warwickshire UK, which we visited in August 2015. 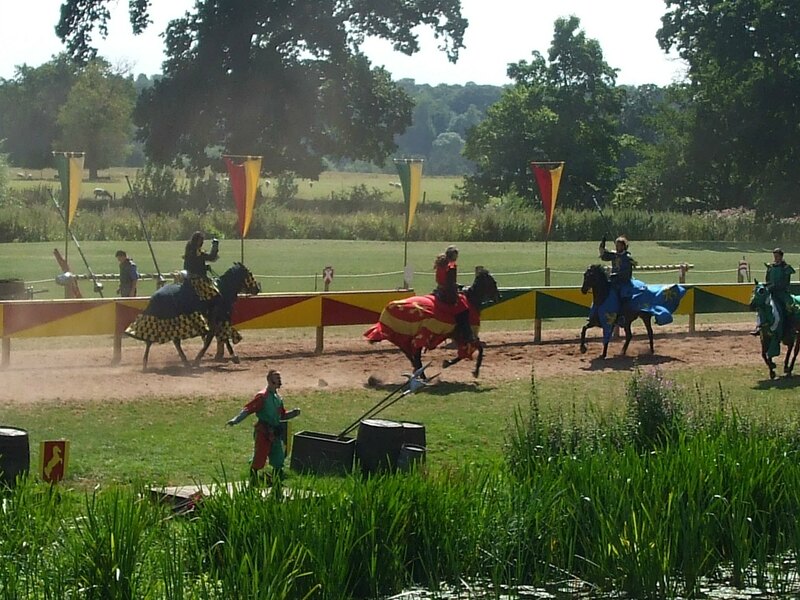 This time I’d like to show some photos of the event we actually went to Warwick to see: the joust. The joust is one of the seasonal attractions at Warwick Castle, the others being demonstrations of the trebuchet (pronounced treb-you-shay) in action, birds of prey shows and many others. Events do change from year to year, and not all are held in the summer holidays. During other school holidays, like half-term and Easter, several events are put on, especially ones for children (or ‘little warriors’). This year (2017) in both May and September, there will be ‘The Wars of the Roses Live’, which I’d like to try to get to! There’s also a Kingmakers Medieval Banquet in February. Here’s a link to the officials Castle Events Guide for this year. All spectators were seated on the grass at the opposite side of the river, which is a fair way back from the action, and as none of us apart from Louise had a decent zoom on our cameras, I’m afraid the photos aren’t too wonderful. Nor did it help that people kept bobbing up in front of us, but as most of them were children, they’re forgiven. It was a fun event, made even better by the lovely sunny weather (which has to have an obligatory mention for any outdoor event in Britain!) – not to mention the handsome and chivalrous knights, who kindly made themselves available for interacting with spectators afterwards. And a little head bobbed up. That’s all about Warwick Castle for now. This looks like a very fun day! you are so lucky to see a joust!! Although we have the SCA here I’ve only seen the hand to hand type combat! great images! I’ve been to several jousts and have loved them all. The best one was at Belvoir Castle (pronounce Beaver) a few years ago. The ‘knights’ were the best in their field, worldwide, and they put on a magnificent display. They’ve even featured in films. I just wish we’d thought to film the one at Warwick. I’ll remember next time! Thanks Cybele. I’m going to have to go aren’t I? I didn’t realise it was as dangerous for the trebuchet operators as it was for whoever was on the receiving end. Great photos Millie and I loved the video. Thanks for sharing. Thank you for reading them all, Michael. During one trebuchet demo, the fireball hit the wooden boathouse and set it alight. There are one or two videos of it on YouTube, but most only show the boathouse burning and not how the trebuchet works. Thanks for sharing the video Millie. Wow, what a weapon. It sounds like a wonderful experience! I love the pictures! Wars are ugly even when you defend your turf. I’m referring to the use of projectiles as disease-infected carcasses of slaughtered animals or the heads of slain enemies. It seems to me that the knights didn’t wear full steel armour. The video is fantastic. Very interesting post, Millie. Thanks, Irina. It was usually those attacking the castle who used the trebuchets and mangonels, but the defenders were just as likely to hurl enemy heads or whole bodies back over the castle walls. They’d use catapults though, as they wouldn’t get the bigber siege weapons up onto the battlements. Yes, the video is excellent. So you have seen the knights in full armour. Very exciting. Looking forward to your post about the joust at Bolsover. I had no idea you were doing these posts and, by sheer coincidence, have just completed one about Middleham Castle, one of the Neville fortresses in the north. Slightly less complete than Warwick, which I visited yonks ago when the kids were small. I need to go back – it’s a fabulous place and your excellent shots have reminded me how much there is to the place. The jousting looks amazing! Hi! Yes, I’ve been doing what I classify as my ‘Travel and History’ posts for over two years now. Oddly enough, I have one on Middleham Castle waiting to be written up from last summer when we were in Yorkshire, as well as one on Helmsley Castle and several other sites up there. I just can’t keep up with myself, as I do writing challenges, too – not to mention attempting to finish the third book of my Viking trilogy. I must have at least 6 posts on places in Cornwall to do, as well. The trouble is, I keep collecting new post to do. like The Armouries post I did two weeks ago and last years just keep sitting there. Anyway, thank you for visiting. Warwick is a great castle and I’ve taken Year 7’s there many times in the past (i.e. pre-retirement!). The joust was fun, especially as the weather was particularly kind. Another wonderfully enjoyable travel post, I love it! That video of the trebuchet is great, too. It must be very difficult for the people doing the fighting reenactments to learn how to fight realistically enough that it looks dangerous without actually hurting each other. Especially with the jousting, I would think. That seems a very high risk occupation! I remember reading about this joust on your daughter’s blog last year. In my trips to England, I never did make it to Warwick Castle. I loved reading about the architecture and history so I’ll be prepared for my next trip. Thanks for visiting, Clare. I’ve been intending to write about Warwick for many months, but the second half of last year was a bit of a ‘write-off for me, for so many reasons. Warwick is worth a visit if you’re in the Midlands. Millie, Yes, I know that you were working on the third book of your series. I did miss you. I particularly missed our 1 am (my time) chats. Charley and I do intend to visit England some day soon. I love the history behind everything European. I love this post, Millie! I always attend reenactments whenever I have a chance. These people are so very talented, and they live their dreams. It is fun to watch, and plenty to learn about the medieval times. I too wrote a blog about such show a couple of years ago. The jousters are a talented group and very entertaining to watch – lovely and colourful, too. Reenactments teach people so much, without them realising it. And these ‘knights’ were bombarded with questions afterwards, and not all of the questions were from children. No, it is wonderful that you wrote the series of posts. You wouldn’t tell anything in a single post. Fantastic blog, I enjoyed every photograph. Loved all three posts about castles. Keep it up! This is living history! I have looked at these posts of Warwick Castle and it is a very impressive piece of architecture. It made me feel like those movies with Errol Flynn dashing about brandishing his sword, come to life! A real portcullis and drawbridge as well as a castle, not rebuilt and not in ruins! That is really like stepping back in time!